When you’re looking to purchase a new car, you may be wondering if buying or leasing is the better option for you. Buying gives you the benefit of owning your new car and having an investment, while leasing gives you a chance to enjoy a hot new model for a few years before moving on to a new one. Determining which one is the right choice for you, however, comes down to your individual needs and budget. Drivers in West Valley, Murray City, and Orem can find out the important differences between leasing vs. buying here. Many people choose to buy a new car for the investment and freedom. When you finance your car, you’re paying into it with hopes of paying it off and having a valuable asset for resale or trade in the future. You also have the freedom to do whatever you want with it, such as adding accessories or putting on countless miles, without any risk of penalties or overage charges. 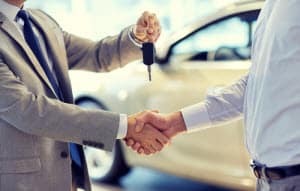 Buying a car has a higher monthly payment than a lease, however, and requires a down payment to keep you from owing more than the car is worth. You’re also financially responsible for any repairs or services it may need, which could add up as the car ages. Yet, owning a car can be much more affordable down the line, especially if you plan on doing lots of travel, or have a job that involves driving your vehicle often. A lease differs from a loan in that it’s a short-term commitment. You’re free to enjoy your new car for a few years before you turn it in, no strings attached, and then you can just move on to a new car. You also have lower monthly payments as well, since you’re only “renting” the car for a short time, and you won’t have many maintenance costs with a newer car. It’s also protected by a comprehensive warranty for any problems it may have. You can buy the car at the end of the lease, but if you decide to turn it in, you don’t have the reward of owning an asset. Leasing can also include penalties for excess mileage or wear and tear, which can be costly when you turn it in. When comparing leasing vs. buying, you can see that they both have their pros and cons, but choosing the right option for you depends on your financial situation, budget, and expectations. This is a big decision, so be sure to consider all aspects of buying and leasing before you make your choice. Drivers in West Valley, Murray City, and Orem can learn more about buying vs. leasing by visiting the Volkswagen finance center at Volkswagen SouthTowne. Call or stop by today to speak with a financial specialist about your financing options!